The Central Plains through the Great Lakes region are the focal point of activity Sunday morning as they brace for multiple rounds of rain in the next few days. A slight risk for flash flooding is being monitored as storms roll in. The same region received severe storms on Saturday, with Fairbury, Nebraska, seeing an 83 mph wind gust and Montezuma, Iowa, receiving 6.48 inches of rain. There is a marginal risk that thunderstorms could become strong to severe during the afternoon and evening on Sunday. The primary threats will be damaging winds and hail for the Midwest. Kansas and Nebraska should be aware of the possibility for brief tornadoes as well. 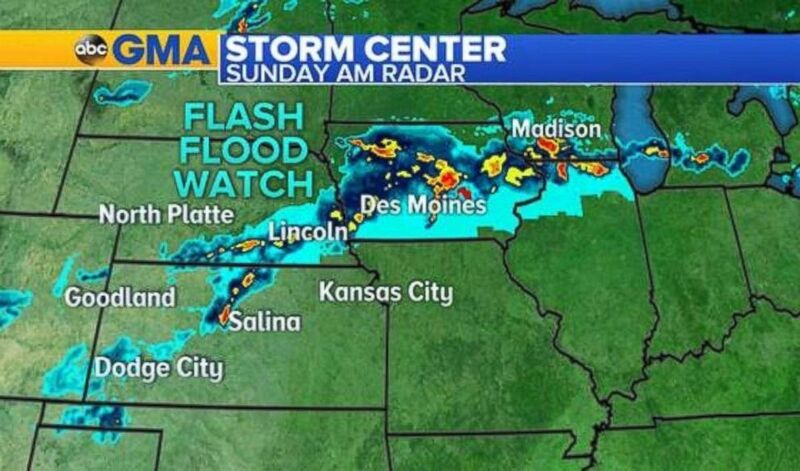 Heavy storms are moving through Iowa on Sunday morning. Tropical Storm Florence has max sustained winds of 50 mph and is moving west-northwest at 14 mph away from the Cabo Verde Islands and into open water. Florence remains out to sea through the middle of next week with no threat to land as it slowly strengthens. By Thursday, it still projected to be categorized as a strong tropical storm. Florence will remain a tropical storm at least through the middle of the week ahead. We’re still watching the tropical wave in the Caribbean as it slowly treks west-northwest over time. There is now a 50 percent chance for this disorganized cluster of showers and thunderstorms to form into our next named Atlantic storm by the middle of next week. As the system moves further into the Gulf of Mexico, the environment becomes more favorable for the storm to become more organized. Tropical moisture will bring rain to Florida and the Gulf Coast for the next few days. 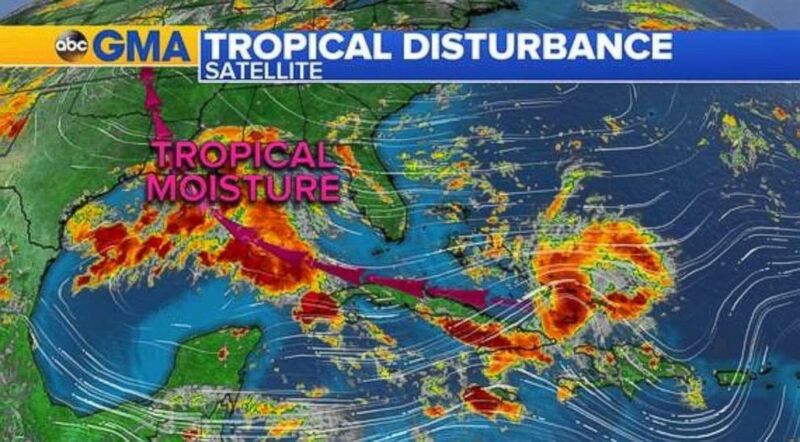 Regardless of development, the system will ring heavy rains to the Bahamas and southern Florida over the next few days, and the moisture will help fuel showers and storms for the Gulf Coast through the Plains for the remainder of the weekend. Some places already hard hit by heavy rains could receive an additional 1 to 2 inches or more in the coming days. Scattered showers and thunderstorms are possible, due to increased tropical moisture, from the Southeast to the Northeast through Monday -- but don’t expect a complete washout. 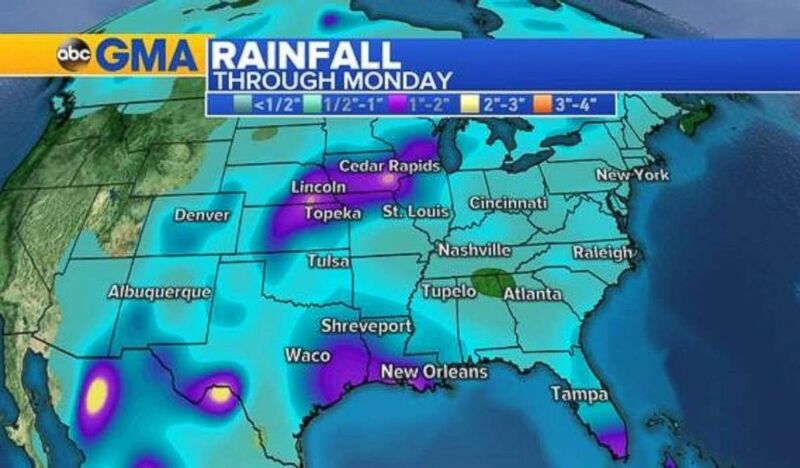 The west and central Gulf Coast, Lower Mississippi Valley and Southern Plains will see the moisture from the Gulf of Mexico on Sunday and Monday. This could bring widespread rain and storms for the Labor Day holiday. Rain will be heaviest in on the Gulf Coast and through the central U.S. In the Southwest, monsoon moisture will keep the threat for thunderstorms around with locally heavy rainfall potential through Monday afternoon and evening. Areas remaining dry include the northernmost parts of the Northeast and from California to Montana. The West Coast is winning this weekend.